This purple vanity case has a solid metal frame allowing it to be resistant to pressure and allowing it to handle up-to 25kg of weight comfortably. The case is light-weight plus is also waterproof. The unique design of this purple makeup box has 4 collapsible shelves and 8 adjustable clapboards in it, the shelves can be divided into different sizes for your need! Just remove the plate and adjust the trays/shelves to fit the size of your makeup storage requirements! 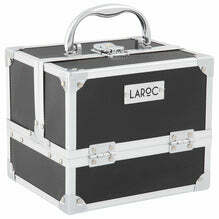 This case comes with a lock and 2 keys, allowing your makeup storage to be safe at all times.